Hypothesis The treatment of cancer in elderly patients has become a global clinical issue, considering the increasingly longer life expectancy. Three quarters of patients with pancreatic adenocarcinoma are older than 60 years. Surgical resection is the only chance of cure, and early outcome of pancreaticoduodenectomy in elderly patients is comparable with that obtained in a younger population. Design During an 11-year period, 166 patients underwent curative pancreaticoduodenectomy for pancreatic adenocarcinoma. Clinical and demographic factors were evaluated by univariate and multivariate analyses to test their effect on early outcome. Setting State university medical school tertiary care center. Patients One hundred sixty-six patients underwent curative pancreaticoduodenectomy for pancreatic adenocarcinoma. They were divided into 2 groups according to age (group A for patients older than 70 years, group B for patients younger than 70 years). Intervention Pancreaticoduodenectomy was performed using a Whipple procedure. An end-to-end pancreaticojejunostomy was constructed. Lymphadenectomy was carried out along the hepatoduodenal ligament, common hepatic artery, vena cava, superior mesenteric vein, and along the right side of the superior mesenteric artery. Four abdominal drainage sites were routinely used. Main Outcome Measures The postoperative hospital stay was calculated and morbidity and mortality were assessed. Results Significantly higher operative morbidity and mortality were observed in group A (group A, 49.1% vs group B, 45.8% and 10.5% vs 3.7%, respectively). Underlying comorbid conditions in group B patients influenced postoperative morbidity but not mortality. Rate and nature of surgical complications were indicated as causes of significant higher mortality in group B patients. Conclusions An aggressive surgical approach is justified for elderly patients with pancreatic adenocarcinoma. However, surgical complications that lead to reoperation are responsible for a high mortality in elderly patients. In addition to general causes, such as concomitant disorders, reduced functional reserve, poor tolerance to stress, and the texture of the pancreatic remnant, there are specific prognostic factors affecting pancreaticojejunostomy leakage and related mortality. The aim of the present study was to assess the safety of pancreaticoduodenectomy in patients older than 70 years and to show how advanced age influences morbidity and mortality in such a demanding procedure. From January 1990 to December 2000, 193 patients with stage I and stage II adenocarcinoma of the pancreas were considered for curative pancreaticoduodenectomy at the First Department of Surgery of the University of Rome “La Sapienza” Medical School, Rome, Italy, or at the Department of General and Thoracic Surgery of the University of Perugia Medical School, Perugia, Italy. One hundred sixty-six patients with an American Society of Anesthesiologists score less than 4 were submitted to surgery. The study population, which consisted of 102 men and 64 women, with a mean (SD) age of 64.3 (10) years (range, 25-85 years), was divided into 2 groups according to age. Group A patients were 70 years or older, and group B patients were younger than 70 years. The medical history of each case was reviewed and demographic data, symptoms, and comorbidity (ie, coronary artery disease, hypertension, diabetes mellitus, chronic renal insufficiency, and chronic obstructive pulmonary disease) were considered. All patients underwent contrast-enhanced thoracic and abdominal computed tomography, abdominal ultrasonography, and complete blood tests. Biliary tree examination was performed with endoscopic retrograde cholangiopancreatography or magnetic resonance imaging. No patients underwent preoperative biliary drainage, nor was preoperative or postoperative adjuvant therapy administered. All procedures were performed under control of 2 experienced pancreatic surgeons. All patients received prophylactic antibiotics preoperatively (cefotaxime sodium plus metronidazole). Octreotide administration was started during the operation and continued for 7 days (0.1 mg subcutaneously 3 times a day) in an uneventful postoperative course. Proton pump inhibitors were administered for 21 days starting the day before surgery. All pancreatic head resections were carried out by experienced senior surgeons. Pancreaticoduodenectomy was performed using a Whipple procedure, and an end-to-end pancreaticojejunostomy (PJA) was constructed with a double-layer anastomosis of interrupted 4-0 nonadsorbable sutures. Lymphadenectomy was carried out along the hepatoduodenal ligament, common hepatic artery, vena cava, superior mesenteric vein, and along the right side of the superior mesenteric artery. No transanastomotic catheters were placed in the pancreatic or biliary ducts. Four abdominal drainage sites were routinely used: 2 soft drains were placed near the pancreaticojejunal anastomoses, 1 drain in the subhepatic space near the hepaticojejunostomy, and 1 in the Douglas pouch. Operative time and intraoperative blood loss were recorded. In the absence of a fistula, the drains were removed after 7 days. Based on intraoperative dissection, surgeons defined the consistency of the remnant pancreatic parenchyma as “soft and normal” or “hard and atrophic.” Pancreatic duct size was classified as “small” (diameter ≤3 mm) or “dilatated” (diameter >3 mm). All surgical specimens were reviewed by 2 senior pathologists. Clinical and pathologic staging were reassessed according to American Joint Committee on Cancer TNM staging of pancreatic cancer (2002). The postoperative hospital stay was calculated and morbidity and mortality were assessed. Complications were registered and classified as medical or surgical: pancreatic fistula (surgical), stump acute pancreatitis (surgical), biliary fistula (surgical), delayed gastric emptying (surgical), intra-abdominal or gastrointestinal tract bleeding (surgical), cholangitis (surgical), intra-abdominal sepsis (surgical), wound infection (surgical), urinary tract infection (medical), pneumonia or respiratory failure (medical), renal failure (medical), cerebrovascular accident (medical), and myocardial infarction or arrhythmia (medical). Postoperative pancreatic fistula was defined as drainage of greater than 50 mL of amylase-rich fluid (>3 times the upper limit of the reference range for serum amylase level) through the intraoperatively placed drain after day 4 and persisting after day 10. Biliary fistula was defined as biliary staining from drainage fluid. In the presence of pancreatic or biliary fistula therapy, octreotide and antibiotics administration were prolonged and an operative procedure was performed if necessary. Postoperative delayed gastric emptying was defined as a daily output greater than 500 mL from the nasogastric tube after day 5. Mortality was defined as death during hospitalization or within 30 days of hospital discharge after resection. Primary end points include postoperative survival, postoperative complications, and length of hospital stay. The results of parametric and nonparametric data were expressed as mean (SD) and median (SD), respectively. All variables were dichotomized. Confidence intervals were set at 95%. A 2-sided P value of <.05 was considered statistically significant. Univariate comparisons were carried out using Fisher test and χ2 test for discrete variables and t test and Kruskal-Wallis test for continuous variables. Multivariate analysis was performed with a logistic regression test. The mean (SD) age at the time of pancreaticoduodenectomy was 64.3 (10) years (range 25-85 years); 57 patients were 70 years or older (group A). There was a total of 102 men and 64 women. The most frequent symptoms were jaundice and weight loss (78% and 40%, respectively). Bilirubinemia evaluation revealed a mean (SD) value of 8.9 mg/dL (range, 1-21 mg/dL). Eighty-nine patients (53%) had associated medical conditions, 35 (61%) in group A and 54 (49%) in group B (P = .19). Demographic and clinical data are presented in Table 1. The mean (SD) operative time was 405 (56) minutes (range, 300-610 minutes) (mean, group A, 416 minutes and group B, 399 minutes; P = .07). Intraoperative blood losses were comparable in group A and group B (646 mL vs 676 mL; P = .21), with a mean (SD) value of 666 (148) mL (range, 410-1250 mL), and transfusion requirement did not differ. No resection of the portal-mesenteric axis or adjacent organs was performed, and all patients underwent potentially curative surgery. The texture of the pancreatic parenchyma was judged by the surgeon to be “soft and normal” in 99 patients (60%) and “hard and atrophic” in 67 patients (40%) (56% in group A and 62% in group B; P = .51). The Wirsung duct size was classified as “small” in 100 cases (60%) (32 in group A and 68 in group B; P = .50). Resected lymph nodes were histologically positive for metastases in 128 specimens (77%) (44 in group A and 84 in group B; P > .99). Table 2 details the pathologic results. The postoperative complications and course are presented in Table 3. There were no intraoperative deaths. Mean postoperative hospital stay was 16 days (range, 10-31 days) (16 days in group A and 16.3 days in group B; P = .62). There was no significant difference in the intensive care unit stay between the 2 groups (3.1 days in group A vs 1.9 days in group B; P = .09). There were 6 postoperative deaths in group A (10.5%) and 4 in group B (3.7%) (P = .09), for an overall mortality rate of 6%. Five patients died following pancreatic fistula and 2, following hemorrhage. Four patients (including the 2 who had hemorrhage) died in the postoperative period from multiple organ failure after sepsis due to PJA leakage. One patient died after myocardial ischemia. The overall complication rate was 42.7% (43.8% in group A and 42.2% in group B; P = .86). The most common complications were pancreatic fistula (9%) and pneumonia (7.2%). The incidence of pancreatic fistula was similar between groups A and B (14% vs 13.8%; P = .99). In 14 patients, surgical complications were approached conservatively with aggressive medical therapy (ie, octreotide plus antibiotics, total parenteral feeding). In no cases was percutaneous drainage of an infected fluid collection performed. Fourteen patients with instability of clinical course for sepsis or intra-abdominal hemorrhage underwent surgical reintervention with aggressive debridement, extensive drainage, or completion of pancreatectomy when required. Postoperative mortality of reintervention was significantly higher in group A patients (83.3% vs 12.5%; P = .02). All patients were discharged home. Univariate analysis showed no significant difference between the 2 groups of patients, except for reintervention mortality. When length of stay and rates of postoperative morbidity and mortality were considered, univariate analysis showed a worse clinical course in patients with associated diseases, with “soft and normal” parenchyma, and with small Wirsung ducts (Table 4). Multivariate analysis confirmed associated diseases, pancreatic texture consistency, and duct size as the independent factors affecting early outcome after pancreaticoduodenectomy, regardless of the age of patients (Table 5). 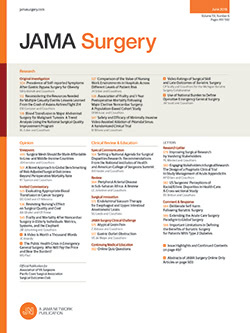 Despite poor long-term survival, surgery is the only recognized potentially curative treatment for malignant disease of the pancreatic head.23,24 However, enrollment criteria, the upper limit of surgical aggressiveness, and reconstructive options are still debated.25 In the last few decades, the general goal of enhancing the curative effectiveness of surgical resection has led to extending the excision of the pancreatic head to the regional connective, lymphatic, and neural tissues and to including, in select cases, more or fewer extended segments of portal and mesenteric vessels.6,11,26-30 Despite increasing the operative morbidity, this aggressive approach has led to a wider recruitment of patients for potentially curative surgery. However, until recently, elderly patients have been excluded by this trend because of the overall unfavorable long-term outcomes that have caused this approach to be considered unadvisable for patients with short life expectancies.22,31-45 Reduced mortality (<5%) and morbidity (<30%) suggest that pancreaticoduodenectomy should be offered to all patients with resectable disease, with no upper age limit.4,6,12,18,20 Furthermore, populations of developed countries are aging, and age is considered an etiological risk factor for pancreatic adenocarcinoma. It is likely that adequate treatment for elderly patients with pancreatic adenocarcinoma will become a topic of discussion in the next few years. Elements affecting pancreatic operative morbidity and mortality have been divided into patient-related, regional-related, and procedure-related factors.35 Patient-related parameters, such as medical comorbidities, have been stressed as the main reasons for higher complication rates in elderly patients.18,20,31,36,37 The significantly higher number of associated medical diseases detected in our group A patients was confirmed by statistical analysis as affecting early outcome. Nevertheless, while an identical aggressive approach was adopted, no difference in surgical complications was evidenced between the 2 groups of patients (30% vs 29%; P = .99). Careful preoperative monitoring, including evaluation of surgical stress compliance, routine postoperative intensive care, use of parenteral support, and octreotide prophylaxis are the main tools adopted successfully in our experience to reduce morbidity and to contain the number of medical complications leading to death. While the rate of surgical complications and that of reintervention did not differ between the 2 groups, a significantly higher operative mortality was observed in group A patients. Such an unfavorable outcome was exclusively attributable to the exceedingly high mortality rate registered in elderly patients undergoing reoperation because of surgical complications, mainly because of PJA-complicated leakage. This leakage remains the most feared complication of pancreatoduodenectomy.15,23,35-40 Several studies have shown that rates of PJA leakage are influenced by the texture of the pancreatic remnant.13,21,23,41,42 When this correlation was analyzed in our series, although no correlation was shown to exist between age and texture of the pancreatic remnant, a soft pancreatic stump was an independent factor directly affecting PJA leakage. Experienced surgeons are well aware that hard parenchyma can be anchored tightly to the seromuscular coat of the jejunal loop,21,43,44 while soft and friable parenchyma are easily injured by stitches, making a safe anastomosis difficult to achieve. Comorbidity, concomitant systemic disorders, reduced “functional reserve,” and poor tolerance to repeat surgical stress are the elements possibly responsible for the high mortality rate in elderly patients.22,45 Whatever the cause, we searched for alternative surgical procedures to lower the reoperation rate and related postoperative mortality, yet obtain standard oncologic clearance. Ligation and chemical occlusion of the pancreatic duct and suture of the pancreatic stump, alternatively used for many years to avoid PJA but never used in the present series, have been recently proposed for the treatment of difficult pancreas.43,46 Should PJA not have been performed in elderly patients with soft pancreatic remnant, accounting in our series for as many as 56% of all elderly patients, it is reasonable that the rate of reoperation and consequent mortality would have been lower. To verify this assumption, in 2001 we began to replace PJA with Wirsung duct closure by ligation in patients older than 70 years with an intraoperative finding of soft gland. The results of this approach, though limited to a few cases, are encouraging. All 6 patients who underwent this procedure developed a clear pancreatic fistula that spontaneously healed within 60 days, with no mortality. In conclusion, our study confirms pancreaticoduodenectomy as an effective procedure to treat pancreatic adenocarcinoma, safely applicable to patients older than 70 years. Nevertheless, in aged patients with soft pancreatic remnant, the relevant mortality associated with reoperation for PJA disruption should suggest a more cautious surgical strategy. Correspondence: Adriano Tocchi, MD, Via Bruno Bruni, 94, 00189 Rome, Italy (adriano.tocchi@uniroma1.it). Accepted for Publication: May 19, 2005.